15S to Old Castle Rd. exit. Take the little jog and then a left back onto Old Castle Rd. Old Castle Rd. will curve around and become Lilac Rd. (Do not turn onto Lilac Rd.) Lilac Rd. will come to its completion at the stop light at Valley Center Rd. It is somewhere between 9 and 11 miles from 15S to Valley Center Rd. Make a right at the stoplight at Valley Center Rd. Go approximately one (1) mile and make a left at the stoplight at Woods Valley Rd. Go 2.2 miles on Woods Valley Rd. and make a left into our park. 15N to Via Rancho Parkway. Turn right onto Via Rancho Parkway at the stoplight. Via Rancho Parkway will curve around and become Bear Valley Parkway to its completion at Valley Parkway. Turn right on Valley Parkway. Valley Parkway will become Valley Center Rd. Turn right at the stop light at Woods Valley Rd. Go 2.2 miles and make a left into our park. 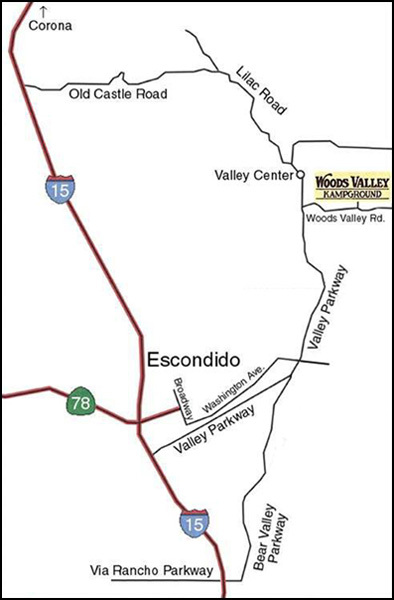 78E into Escondido – Turn left at Broadway. Stay on Broadway until you get to the stoplight at El Norte Parkway. Turn right on El Norte Pkwy. Continue on El Norte until you reach the Valley Pkwy intersection. Make a left onto East Valley Pkwy. Go to stoplight at Woods Valley Road and make a right. Continue 2.2 miles and turn left into our park. Contact us today for details on our family oriented RV Park & Campground outside the city of San Diego!